After a great third quarter, Apple is back on top of the wearables market, with a new report from Canalys stating that the tech giant now controls nearly a quarter of the wearable market at 23 per cent. According to the Canalys’ Wearable Band Go-To-Market Analysis report, the release of the Apple Watch Series 3 pushed Apple back into the top spot with 3.9 million shipments in Q3. This has pushed Chinese wearable marker, Xiaomi, back into second place at 3.6 million shipments. Fitbit rounds out the top three at 3.5 shipments. 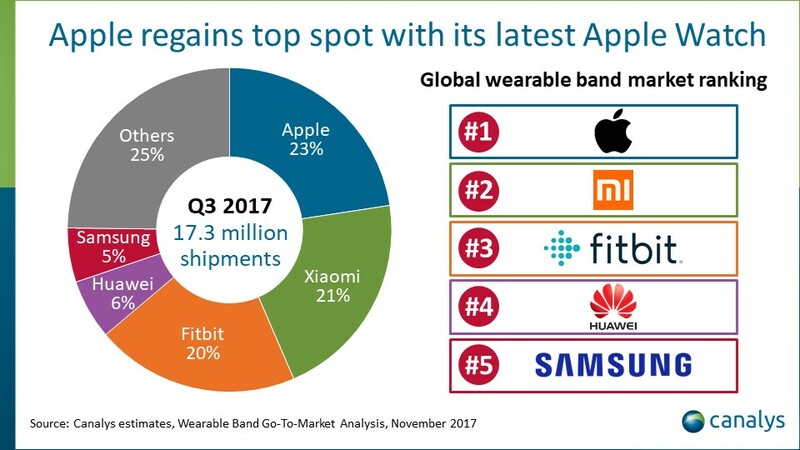 The big three wearable manufacturers – Apple, Xiaomi, and Fitbit – accounted for 64 per cent of the entire global market in the third quarter of 2017. The overall market saw 17.3 million shipments, which is a two per cent decrease from the previous quarter. The Apple Watch Series 3 became the first LTE-capable smartwatch when it released this September. According to the report, Canalys estimates that 800,000 Apple Watch units shipped in this quarter were cellular-enabled. “Strong demand for the LTE-enabled Apple Watch Series 3 has dispelled service providers’ doubts about the cellular smartwatch not appealing to customers,” said Canalys analyst Jason low in the report. On top of its new built-in cellular capabilities, it also features streaming music and a faster dual-core chip. Health and fitness updates were another big focus when Apple announced the device at its iPhone reveal event. Despite overall shipments down in the third quarter, Canalys predicts a rebound this holiday season due to a combination of new smartwatches highlighting better and slimmer designs, improved health-tracking features, and longer battery life.